My foster family is adopting me!!! Hi! My name is Big Bird, but they call me Big Bird "2" since there is already another macaw here at Mickaboo named "Big Bird." 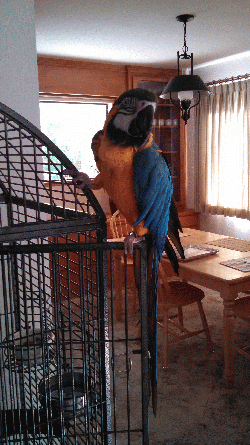 I am a 2 year old Blue and Gold Macaw. I came to Mickaboo in hopes to find a family that is comfortable with my big beak. I am a good bird, I don`t bite and I`m very lovable. I love head scritches. I enjoy spending time out of my cage and with my family. I enjoy eating my fruits and veggies, and will be soon introduced to a Pelleted diet. If you are interested in learning more about me, please contact my coordinator!